Thanksgiving 2011 was my first truly allergy-friendly Thanksgiving, so I had to hunt down some new recipes this year. Some of them were huge successes. Only one attempt had to be tossed. And I made a couple of cool discoveries. 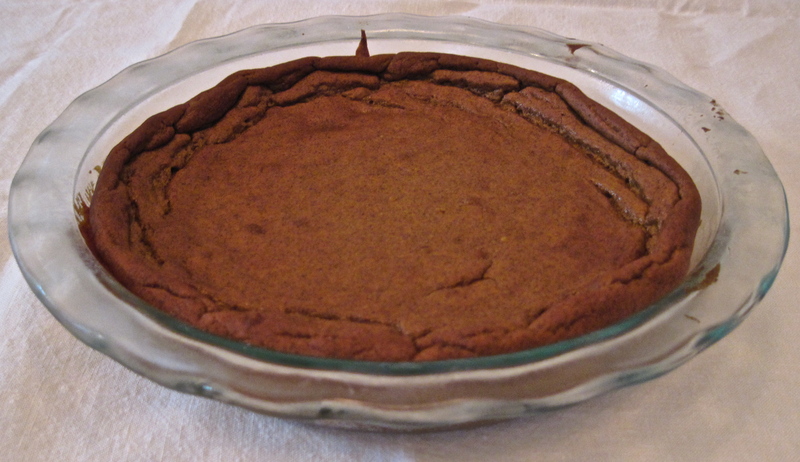 Gluten-free, vegan, soy-free pumpkin pie! My biggest success this year by far was my pumpkin pie. Pumpkin pie is definitely one of my favorite things — if not my top favorite thing — about Thanksgiving. I knew I could make baked apples or something for an allergy-friendly dessert, but I was determined to find a recipe for pumpkin pie that I could eat. A quick Google search turned up numerous gluten-free pumpkin pie recipes or vegan pumpkin pie recipes. Many that I could eat looked quite complicated or involved a super long list of ingredients. A couple used a prepared gluten-free crust, which I find often have ingredients I can’t or don’t want to eat. • The ingredients list “1 1/2 cups full fat coconut milk (or vanilla soy/almond milk)” and I wanted to make sure this was canned coconut milk for cooking, not coconut milk from a carton meant for drinking. The only reason I questioned this was because it says you can sub almond milk (or soy milk), which I believe are going to be thinner than canned coconut milk, and I wanted to get the consistency right. After reading through almost all the comments, Karina does indicate she uses canned coconut milk. • Also, I was a little nervous to cook with buckwheat. I’d never used buckwheat flour before, but I had made Bob’s Red Mill creamy buckwheat cereal, which has a gummy texture, a weird purplish color and not the greatest taste. 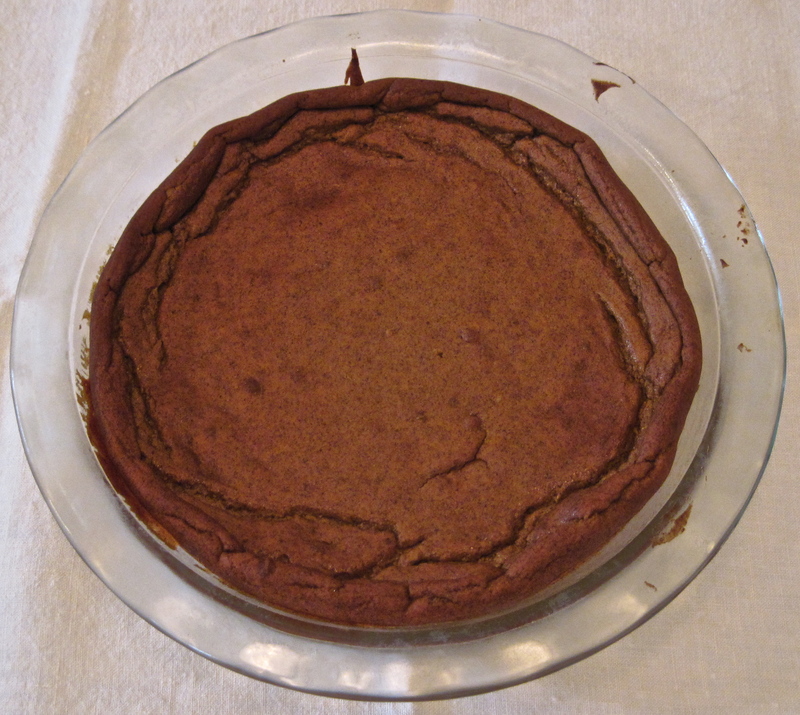 After reading through all the comments, I noticed a number of buckwheat-related questions or comments about an unpleasant color to the pie, to which Karina responded that she uses Arrowhead Mills buckwheat flour (certified gluten-free) and the brand of buckwheat might make a difference in color, for instance. When I went to Whole Foods to buy my pie ingredients, I checked their bulk foods buckwheat flour. It said “dark” on it, so I promptly hunted down the Arrowhead Mills bag! • Finally, it helped to know that you have to use a glass pie plate for this recipe. And this part helped me a lot: “The pie should be firm — but still give a little when lightly touched. The center should not be wet. It will fall a bit as it cools.” After half an hour, the pie puffed up much higher in the center than I expected! So I checked it with my finger at the 45-minute, 55-minute, 60-minute and 65-minute marks. Up until the 60-minute or 65-minute mark, there was a dry top to the pie, but I could tell there was a gooey-liquid feel just underneath. My fingerprint stayed for a number of seconds after I touched it. After about 60 or 65 minutes, it felt more solidified and my fingerprint disappeared quickly. I left it in for 65 minutes because Karina mentioned she’s at a higher altitude, so I didn’t know how her experiences would compare to mine. After letting the pie cool to room temperature, and then sticking it in the fridge overnight, I was almost certain the pie had turned out correctly. The center had fallen, leaving a crust-like effect around the edge. It felt like a pumpkin pie when I touched it. Cutting into the pie, the piece came away from the dish and the rest of the pie with ease. It held its shape — and it was without a doubt the best pumpkin pie ever! Just as Karina says, you could serve this to pumpkin pie fans with no dietary restrictions and they’d love it, too!